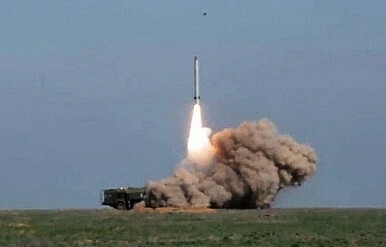 A Iskander-M missile test conducted in April 2016. The Russian military has test fired the short-range nuclear-capable 9K720 Iskander-M (NATO reporting name SS-26 Stone) ballistic missile during a large-scale military exercise in Russia’s Far East this week, according to local media reports. According to an Eastern Military District spokesman interviewed by TASS news agency, the missile was successfully launched from the Jewish Autonomous Area bordering China’s Heilongjiang province and successfully destroyed its target 300 kilometers away. “The launch was carried out from a training site in the Jewish Autonomous Area. The missile hit a target at a proving ground in the Amur region 300 kilometers away,” the Eastern Military District’s spokesman, Aleksandr Gordeyev said. More than 400 officers and men and 100 pieces of military hardware of an unidentified missile unit are participating in the military exercise, held from August 17-20. After the successful launch, mechanized infantry units went on the offensive against a simulated enemy. Overall, the military exercise involves around 10,000 men and 2,000 aircraft, helicopters, and tanks, next to other military hardware in the Trans-Baikal Territory and Amur Region. Russia has held a number of military drills in the Far East over the last couple of months, testing the combat readiness of its troops. “This exercise is a planned measure, which concludes the series of command and staff, special tactical and special exercises and training drills of military governance bodies and snap combat readiness checks in 2016,” according to a Russian military spokesman. The Iskander-M missile purportedly was inducted into service already in 2006. Rumors emerged in March and April 2016 that the missile had been deployed to Syria. The missile was also publicly displayed during this year’s May 9 Victory Day parade. The two-stage solid propellant missile allegedly has a range of 400-500 kilometers (310 miles) and its single warhead can carry a payload of about 700 kilograms. It has been specifically designed to evade Western missile defenses and reportedly is able to operate in temperatures ranging from -50 to 50 degrees Celsius (-58 to 122 degrees Fahrenheit). An inertial guidance system would probably give an accuracy of 200 m CEP while inertial coupled with a Global Positioning Satellite (GPS) or equivalent system would provide about 50 m CEP. The use of the inertial navigation, GPS, and active radar or electro-optical sensors provides an accuracy of 10 to 30 m.
It is unknown how many 9K720 Iskander-M tactical ballistic missiles have been inducted into service to date, although some sources claim up to 100 missile units have so far been added to various missile brigades of the Russian military. A shorter-range export version of the missile has been offered to China, India, and South Korea.